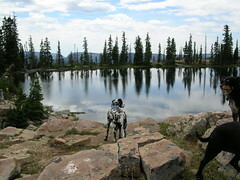 This is a photo of Lady overlooking the eastern Twin Lake. I love this picture: the cloud reflection, Lady’s 1000 yard stance and stillness that is present. Lady is a gentle dog and her personality fits with this photo.